Living in the UAE we’re spoilt with staycation options to enjoy, yet busy schedules often mean we miss out on what the Emirates has to offer. Luckily there’s an extra-long weekend on the horizon which means you can start planning some much needed time-off and escape for the Eid Al Adha holiday, which is expected to fall on 21st to 25th August. From beach resorts to spa treatments and family friendly destinations, we’ve rounded up the best Eid getways to take in the UAE –with unmissable discount deals from Cobone. Whether it’s a desert retreat or an Abu Dhabi city break, these luxe stays will guarantee an extended weekend of relaxation, delight and memories to be made, as you can celebrate Eid in style! The Cove Rotana Resort is hidden on the Ras Al Khaimah beachfront in an idyllic water inlet overlooking the Arabian Gulf, a stretch of pristine beach and lush green hills. The luxury, ward-winning beach resort is offering an indulgent, all-inclusive stay package at The Village this Eid, from AED 699. If you’re looking for a staycation that includes both relaxation and excitement, then this one is for you! This Eid Al Adha, go to the new Warner Bros. World™ Abu Dhabi or Yas Waterworld or Ferrari World and stay at the Park Inn by Radisson, all for AED 789. The Eid playcation packages start from 21st August to 25th August. This Eid escape to the desert for a 3 night half or full board stay at the family-friendly Tilal Liwa Hotel, Madinat Zayed, from AED 549. 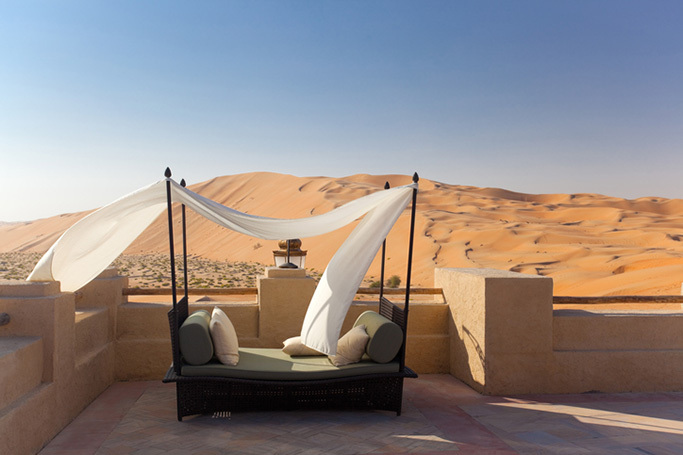 Take a desert safari tour of the Moreeb Dunes and relax at the resort’s infinity pool and sun-lounger terrace overlooking the Rub al Khali Desert. Nestled amid lush greenery in UAE’s picturesque garden city, is the Danat Al Ain Resort which features the best of city, garden and mountain views. With luxurious accommodation, the resort also has a tranquil spa and engaging activities for the kids too. Stay this Eid from AED 475. Located in the heart of the UAE’s capital is the impressive Grand Millennium Al Wahda Hotel which has stunning panoramic views over the city. This Eid, you can stay at the 5* hotel with meals included and theme park tickets for either Yas Waterworld or Ferrari World or Warner Bros. World™ Abu Dhabi for AED 685. Celebrate Eid Al Adha at the One to One Hotel - The Village, from only AED 275. With its stylish modern design and private rooftop pool, this hotel features high-tech facilities and live entertainment in the centre of Abu Dhabi. Set among palm trees, its elegant décor and relaxing spa make this the perfect place to spend the long weekend. If you want to unwind in serenity this Eid, then escape to the Hafeet Mountain and enjoy a staycation at the Mercure Grand Hotel Jebel Hafeet, from AED 649. The resort offers three delicious restaurants to dine in, three swimming pools with water slides for the kids and sophisticated architecture for the adults to admire at sunset.